Upgrading the flooring is one of the most effective ways to give a room a fresh new look. If you want to get rid of the tired old vinyl or linoleum floors in your kitchen, bathroom or elsewhere, you can do the removal job yourself with some basic tools and cleaners. Removing this type of flooring isn’t necessarily difficult, but doing the job right takes some patience. Linoleum and vinyl floors are effectively made of two layers. On top is the plastic-like topper. Underneath that is a sticky paper, felt or synthetic layer called an underlayment. Removing the topper is usually easier than removing the underlayment. In some cases, though, you’ll be able to remove both layers at the same time. Start by clearing the floor of all furniture, appliances, and other items. You won’t be able to pull the flooring out from under these items. Next, remove any baseboards or other trim along the edges of the floor. If you want to salvage these to reuse them, gently pry them off the wall with a flathead screwdriver. Use pliers or the claw end of a hammer to pull the nails out of the trim, then set the trim aside. Check the corners and edges of the floor for a spot where the flooring isn’t fully glued down. In front of a door is a good place to look. Starting at this spot, use a sharp floor knife or utility knife and cut lines into the flooring to create strips. Make the strips around 12 inches wide or less because smaller strips will be easier to remove. From here, you can begin to remove the linoleum topper. How difficult that will be depends on how well the topper has adhered to the surface below. If it isn’t well adhered, you might be able to simply pull the strips of flooring off by hand. In other cases, you’ll need an additional step. Because linoleum and vinyl flooring adhere strongly to certain surfaces, such as concrete, you’ll need to soften the flooring and adhesive to make it pliable enough that you can remove it. A heat gun is the most effective way to do this. If you don’t have a heat gun, you can try using a hair dryer, although it’s unlikely to provide enough heat to soften the flooring. Before you turn on the heat gun, open the windows for ventilation and put on gloves to protect your hands from burns. Kneepads are also a good idea if you plan to work on your knees. With the heat gun on the lowest setting, hold the nozzle a few inches above the flooring. Move the gun slowly along the strip and back to heat the flooring evenly. When the strip of flooring is soft, use a small putty knife to lift the edges of that section. Grab the edge with your hands and peel off the section of flooring. When you have that piece off, heat the next strip and peel it off, and continue working strip by strip. If you’re not able to pull off the flooring by hand or if doing so takes too much effort, you can use an oscillating multi-tool with a rigid scraper blade. To do this, slide the scraper blade under the cut edge of the flooring, turn the tool on and work the blade forward, lifting the loosened flooring with your other hand. Vinyl or linoleum that wasn’t well bonded to the floor under it might come off with the topper and the backing in one piece. If it does, you can finish the job by mopping the floor with mineral spirits, then with water to remove any remaining residue. Chances are, though, you’ll need to do some additional work to remove the underlayment that’s still stuck to the subfloor. Underlayment material can be difficult to remove, especially in the case of older tar paper underlayments. If you have tar paper underlayment, consider calling in a professional for fast, convenient removal. 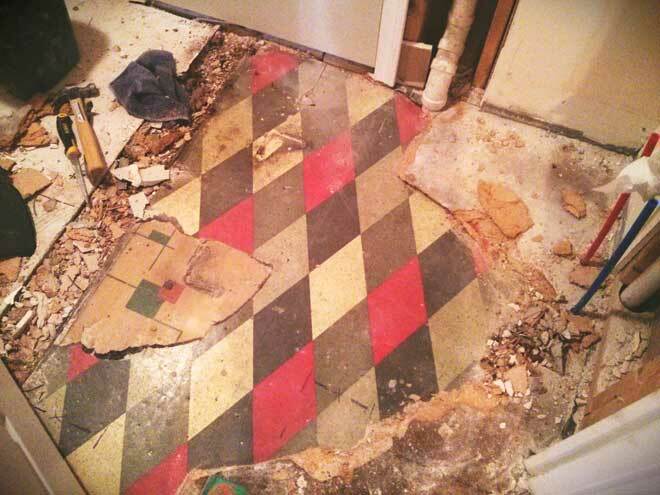 A floor that was installed before 1980 could contain asbestos, so it’s a good idea to have a sample of the underlayment tested before you remove it. When you’re ready to remove the underlayment, put on goggles to protect your eyes from debris that could break loose. If the floor is concrete, you can easily remove the underlayment by heating the paper with a blow torch and simultaneously scraping the paper off using a floor scraper. Keep the windows open for ventilation and wear a paper respirator if you’ll be cleaning anything more than a few small sections of floor. To remove small chunks of paper underlayment from delicate hardwood floors, use a floor scraper or putty knife to gently scrape off the paper piece by piece. To remove larger sections of paper underlayment or felt underlayment, mop the floor with mineral spirits and let the liquid soak in for around 15 minutes. Then use a floor scraper or putty knife to remove as much of the underlayment as you can. If there are stuck-on sections you can’t scrape off or small pieces of underlayment all over the floor, you can use floor stripper or paint thinner to soften them. Before you apply a chemical, check to make sure it’s safe for your floor type and follow the directions exactly. Floor stripper is a strong, caustic chemical. To protect yourself from chemical burns, wear gloves, goggles, and clothing that covers your arms and legs. Open the windows to allow sufficient ventilation. Apply the floor stripper or paint thinner with a mop and let it soak in for 15 minutes, then scrape off the remaining debris. Finally, damp mop the floor to remove residue from the cleaning chemicals. Removing your old vinyl or linoleum flooring gives you a chance to either install new flooring or enjoy your home’s original hardwood flooring. While the job takes some time and effort, it isn’t especially difficult. With the right tools and cleaning solutions, you should be able to clear the floor in an average-sized kitchen or bathroom in a day or two.